Incredible grouping of F. Scott Fitzgerald original prose, written for Helen Hayes' daughter Mary MacArthur, who died of polio at the young age of 19. 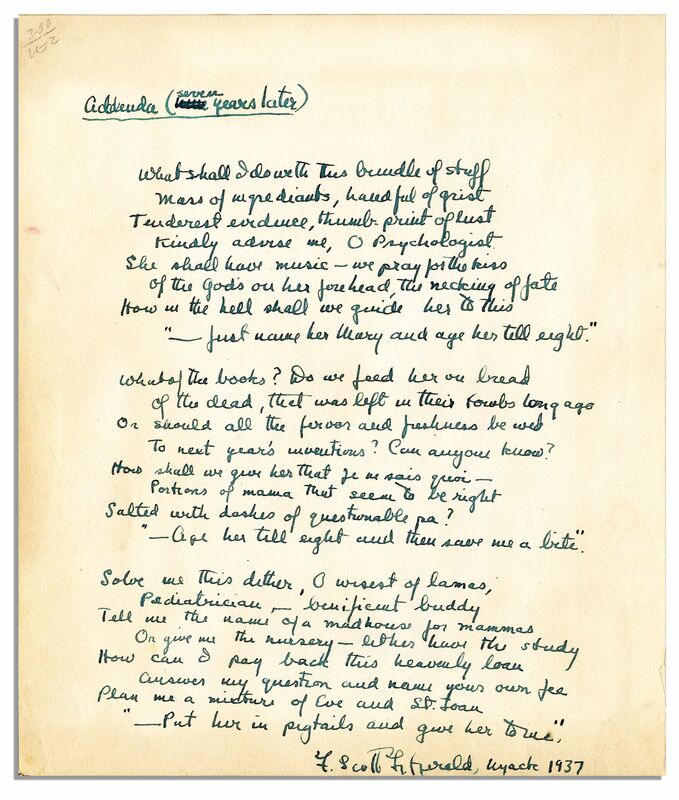 Here, the already famous author pens two lyrical poems, dated 1931 and 1937, in addition to inscribing a first edition of his final novel ''Tender is the Night''. 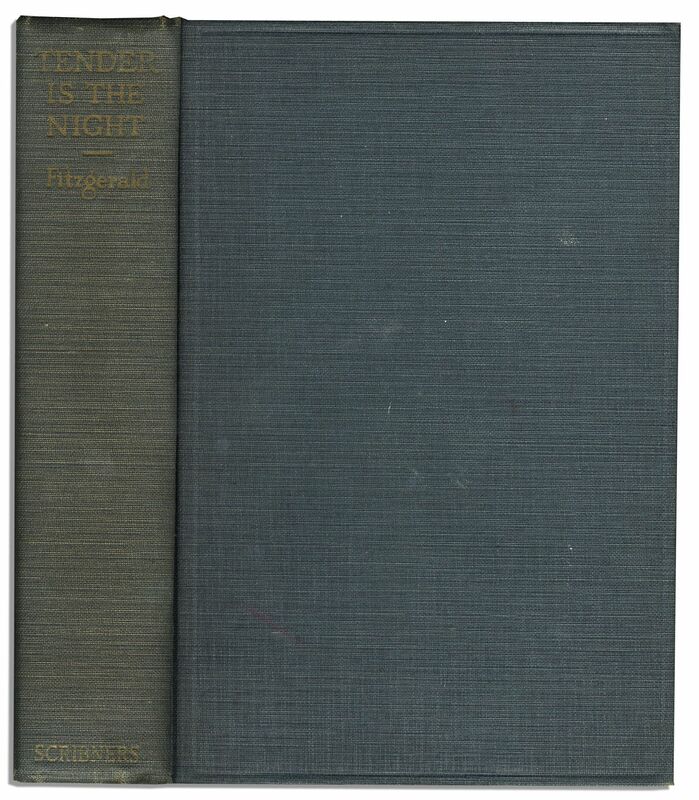 At the time he writes the first poem, Fitzgerald was actually completing ''Tender is the Night'' while caring for his ailing wife, Zelda, whose mental illness had left her hospitalized in 1930. 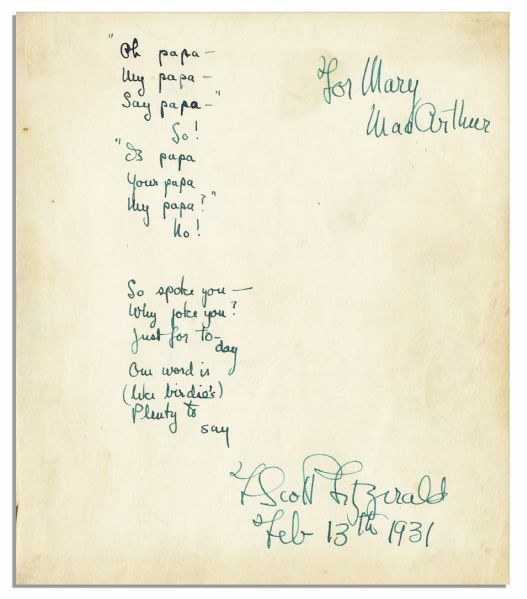 Fitzgerald handwrites the first, shorter poem in green ink. 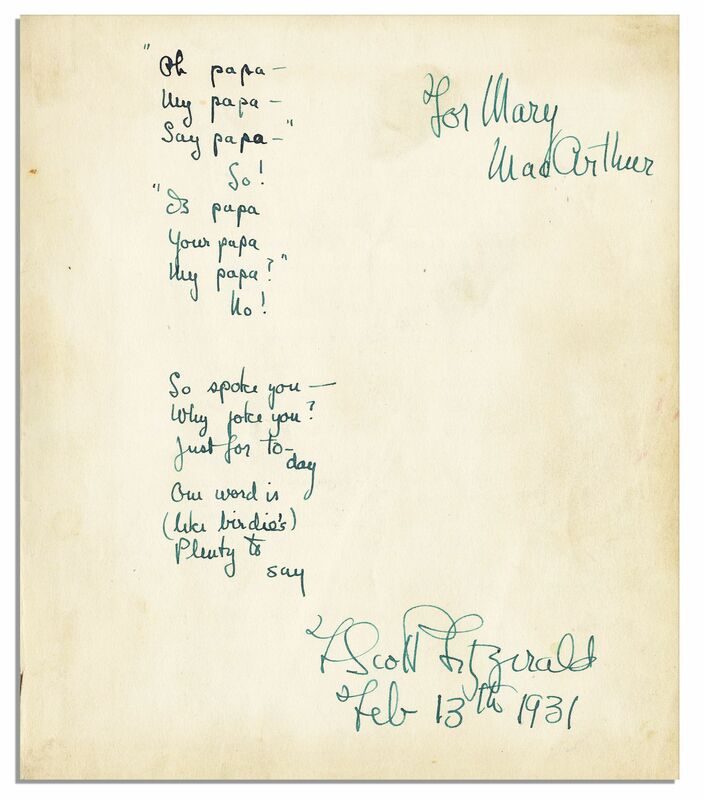 Inscribed ''For Mary MacArthur'', it reads in full: '''Oh Papa -- My Papa -- / Say Papa' / So! / 'Is Papa / Your Papa / My Papa?' / No! / So Spoke You / Why Joke You? Just For To-day / Our Word Is / (Like Birdie's) / Plenty To Say''. Signed, ''F. 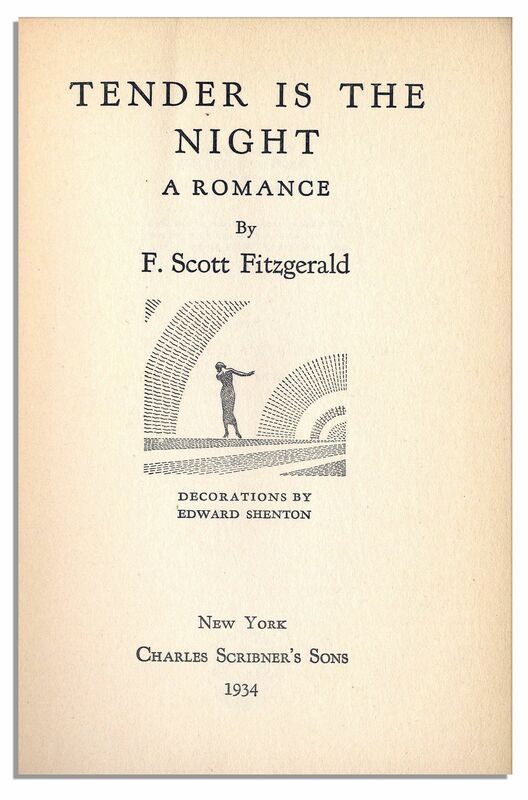 Scott Fitzgerald / Feb. 13th 1931''. 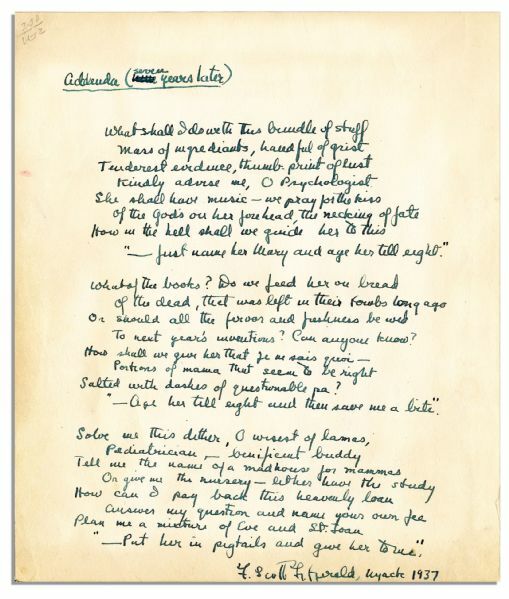 The second, lengthier poem appears on the verso of the same sheet, titled, ''Addenda (seven years later)''. Reads in full, ''What shall I do with this bundle of stuff / Mass of ingredients, handful of grist / Tenderest evidence, thumb-print of lust / Kindly advise me, O psychologist / She shall have music -- we pray for the kiss / of the god's on her forehead, the necking of fate / How in the hell shall we guide her to this / '- Just name her Mary and age her till eight.' / What of the books? Do we feed her our bread / of the dead, that was left in their tombs long ago / Or should all the fervor and freshness be wed / To next year's inventions? Can anyone know? / How shall we give her that je ne sais quoi - / Portions of mama that seem to be right / Salted with dashes of questionable pa? / '- Age her till eight and then save me a bite.' / Solve me this dither, O wisest of lamas, / Pediatrician - beneficent buddy / Tell me the name of a madhouse for mammas / Or give me the nursery - let her have the study / How can I pay back this heavenly loan / Answer my question and name your own fee / Plan me a mixture of Eve and St. Joan / '- Put her in pigtails and give her to me.''' Signed, ''F. Scott Fitzgerald, Nyack 1937''. Sheet measures 7'' x 8'' with poem to front and longer prose poem to verso. 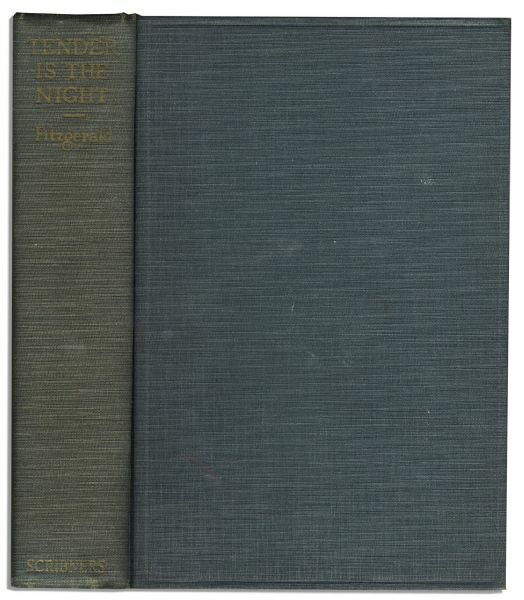 Lastly, lot includes a signed first edition, first printing of ''Tender is the Night'' featuring Fitzgerald's autograph inscription to actress Helen Hayes. Charles Scribner's Sons: New York: 1934. 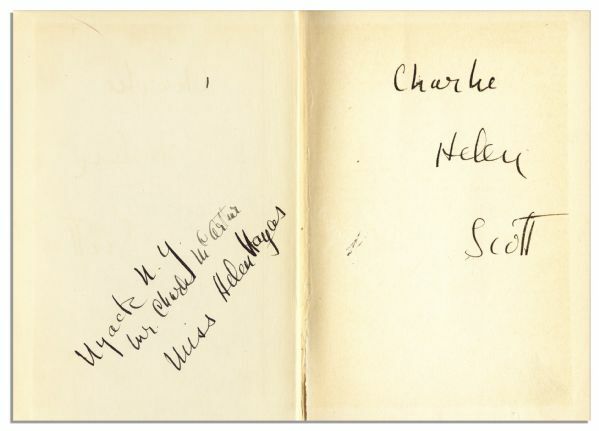 Upon the front free endpaper, Fitzgerald lists the name of Hayes' husband ''Charlie'', her name ''Helen'', and signs simply, ''Scott''. 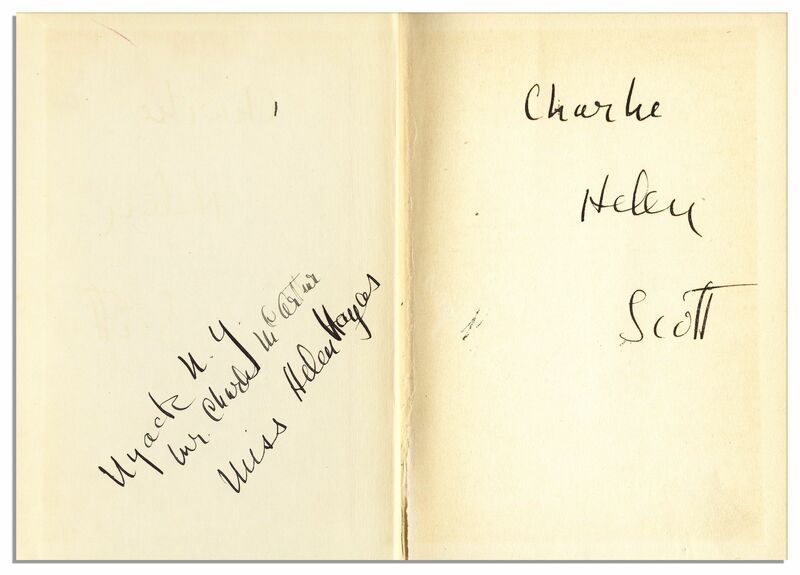 Opposite he inscribes the front pastedown ''Nyack N.Y. / Mr. Charlie MacArthur / Miss Helen Hayes''. Bound in hunter green cloth boards, book measures 5.5'' x 7.5''. Light soiling to front board and toning to leaves, else near fine. From the estate of Helen Hayes. 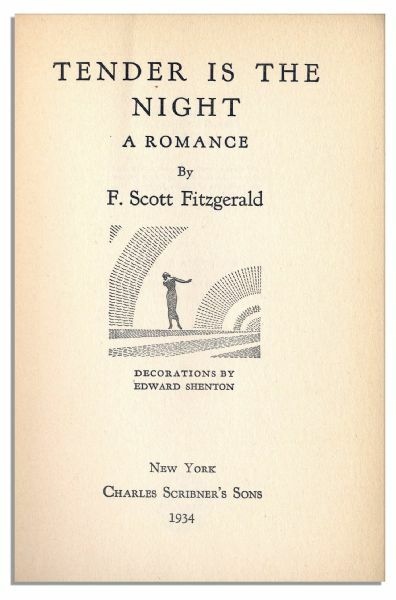 An extraordinary collection, adding to the catalogue raisonne of Fitzgerald's known works.